The House of Trastámara first began ruling Castile in the late fourteenth century. Going even farther back, the Trastámaras came from a cadet line of the House of Ivrea. The House of Ivrea was a Frankish-Burgundian line that could be traced back to tenth century Italy. Thereafter, they ruled in Galicia (Iberian Peninsula), and then Castile and León. In 1369, Henry II, the illegitimate half-brother of the last Ivrean king, Peter, was the first King of Castile that was a member of the House of Trastámara. By the end of the fifteenth century, the Trastámaras would have spread out over Europe and into many powerful, noble houses. For our purposes, one of the more famous members of the Trastámara is Ysabel, or Isabella, of Spain. 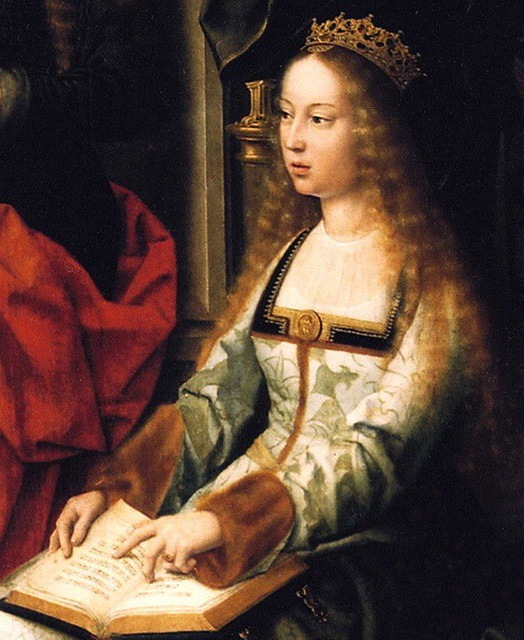 She married Ferdinand of Aragon, uniting the territories of Castile, León, and Aragon. Ysabel and Ferdinand had seven children including the four surviving daughters named Isabella, Maria, Joanna and Catherine. These daughters would all go on to be queens themselves; both Isabella and Maria married the King of Portugal, Joanna became the heir to Ysabel upon her death, and Catherine became a Tudor Queen Consort of England. Isabella of Spain, attributed to Gerard David. Courtesy of Wikimedia Commons. Ysabel was recognized by the pope in her lifetime as one of the Catholic Monarchs, she retook Spain from the remaining Islamic rulers, and it was under her that Christopher Columbus discovered the New World. Her daughter Joanna, sadly, suffered from emotional instability at best and mental illness at worst, and spent most of her adult life in a convent while her son, the Holy Roman Emperor Charles V, ruled Spain in her stead. Isabella, Queen of Portugal, died young and her sister Maria then married the widowed King of Portugal. Maria had eight children that survived to adulthood. Catherine was Queen of England for almost twenty-five years before her marriage was annulled. Ysabel can count as her granddaughters several queens. From Joanna, there was Eleanor, Queen Consort of France through her marriage to Francis I of Valois, and Queen Consort of Portugal by her marriage to Manuel I; Isabella, who was Queen of Denmark, Norway and Sweden; Mary, Queen of Hungary and Bohemia and later Regent of the Low Countries for Charles V; and Catherine, Queen of Portugal. From her daughter Catherine, Ysabel could count Mary I of England, Tudor queen and first Queen Regnant of England, as a granddaughter. Through her youngest daughter Maria, Ysabel’s granddaughter Isabella became a Holy Roman Empress and Beatrice became a Duchess of Savoy. A thorough biography could, and likely should, be written about each one of these women and their daughters. They helped to shape European politics and royal genetics in a way that would echo down through the generations. This very brief introduction into the Trastámarian women during the Renaissance period illustrates that sometimes, if not most of the time, it is the women who leave a lasting influence on the world, even if their names are not the first ones thought of when thinking about history. 1. Edwards, John. The Spain of the Catholic Monarchs 1474–1520. Blackwell Publishers Inc. (2000). 2. Elliot, J.H. Imperial Spain: 1469-1716. New York: Penguin Books (1963). 3. Weissberger, Barbara. Queen Isabel I of Castile Power, Patronage, Persona. Woodbridge: Tamesis (2008). 4. Cruz, Anne J.; Suzuki, Mihoko. The Rule of Women in Early Modern Europe. University of Illinois Press (2009). 5. Jansen, Sharon L. The Monstrous Regiment of Women: Female Rulers in Early Modern Europe. Palgrave Macmillan (2002). ‹ Author Sarah Bryson is Visiting!